Don’t be fooled by the IRT-Pulse’s miniature stature, even the largest avalanche is triggered by the smallest thing. This is no exception! 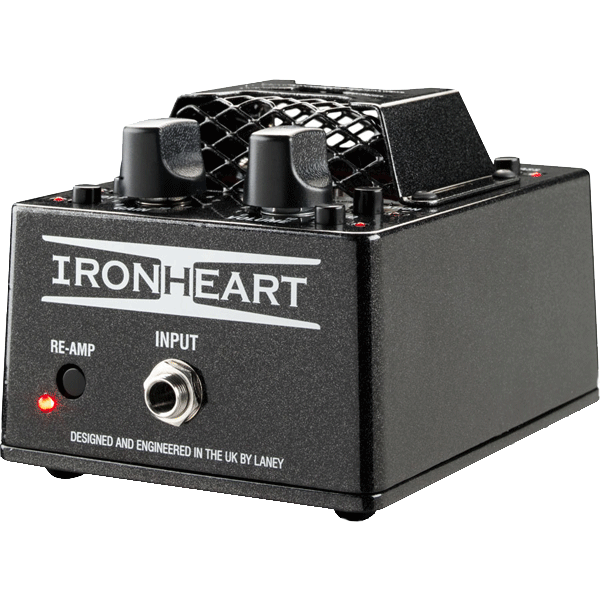 The aim of this unique little box of tone is to capture the sound of the Ironheart series amplifiers in a pedal-size box. The IRT-Pulse is a guitar player’s dream – that comes in black and glowing red! This sinister looking small all-valve preamp has multiple potential applications on stage, at home and in the studio. It ultimately all depends on what you want to do with the IRT-Pulse; one thing is for sure, like Pandora’s box when you open it up it’s going to do what it says. Stick in a pair of headphones and use it as a practice amp. Use the Aux mini-jack to play backing tracks from CDs or MP3 players — these sources are passed through cleanly and mixed with the processed guitar sound. The USB cable allows you to connect the IRT-Pulse to a PC or Mac and use it as a two channel interface. Re-amping your clean guitar track has never been more simple. For jamming live, you can DI the IRT-Pulse into a PA system or plug it into a guitar amp combo’s return jack to use the IRT-Pulse instead of the amp’s own preamp. With its solid metal body in a blacker than black finish, it will look great on your desk or on your pedalboard. The metal grill to protect the pair of ECC83 (12AX7) pre-amp tubes, gives you the feeling it’s hiding one aggressive tone monster behind bars. The red LEDs and glowing tubes tie the whole look together. Simple and intuitive to use, the IRT-Pulse has three voicing switches; Dark, Bright, and the EQ switch. These can be used in any combination to give you more tonal freedom. Simple and sensitive volume and gain dials make for easy tweaking. The 4×12 cabinet emulation circuit from the original Ironheart amp can be switched on and off at the tap of a button. Engage massive amounts of gain or powerful crunch tones with the Hot boost switch. The IRT-Pulse is easy to use and is a powerful USB Valve Guitar Preamplifier that won’t break your bank. Put simply if you’re looking to bring some real tube sound into your recording, practice or live set-up this little box of tricks will be right up your street. See the IRT-Pulse in action in the Official Demo below.